I was delighted to hear that Paul Nimmo has received the Templeton Award for Theological Promise – a prize that comes with $10,000, plus an additional $10,000 to fund a series of international lectures. Paul received the award for his excellent book on Barth, Being in Action: The Theological Shape of Barth’s Ethical Vision (T&T Clark, 2007). For Nimmo, the ontological connection between human agency and God’s act in Jesus does not entail any deification of the human, but rather “the humanization of the ethical agent.” Nimmo thus rightly critiques George Hunsinger’s argument that Barth envisions a realistic “participation” in Christ: for Barth, “participation” is a matter of actualistic/historical correspondence, not of mystical union. Indeed, there is no divine substance in which the human could somehow share; the divine essence is nothing other than the history of God’s way with humanity, arising from God’s eternal election of the man Jesus. The human agent thus participates in Christ not through a mystical union, but through an ethical correspondence to God’s will. In this life, “participation” takes the form of witness. Nimmo thus also responds in detail to Stanley Hauerwas’s critique of Barth’s ecclesiology: Barth is able to relativise the moral function of the church precisely because of his confidence that God is acting in the church. Since the church depends on God’s action, it “cannot arrogate to itself the role of moral teacher or former of moral character.” The church is set free to be the church only where its identity is understood in terms of act and witness – or to put it another way, the church can be the church only where God is really conceived as God. 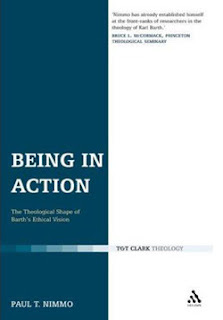 Being in Action is a superb study of Barth’s ethics, and an important analysis of the actualistic ontology which structures the Church Dogmatics. It’s great to see the Templeton Foundation recognising this kind of high-calibre theological research – and it’s very exciting to see the new directions that are opening up in some of the current work on Barth.